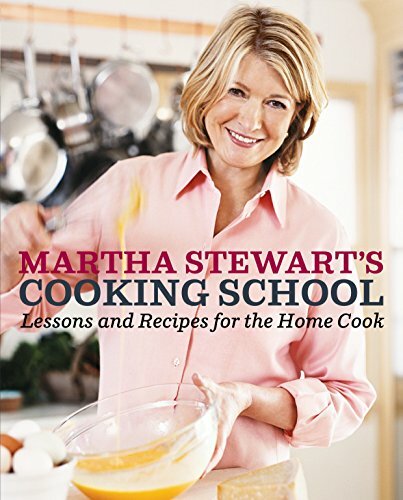 Imagine having Martha Stewart at your side in the kitchen, teaching you how to hold a chef&#x2019;s knife, select the very best ingredients, truss a chicken, make a perfect pot roast, prepare every vegetable, bake a flawless pie crust, and much more.<br /><br />In <i>Martha Stewart&#x2019;s Cooking School</i>, you get just that: a culinary master class from Martha herself, with lessons for home cooks of all levels.<br /><br />Never before has Martha written a book quite like this one. Arranged by cooking technique, it&#x2019;s aimed at teaching you how to cook, not simply what to cook. Delve in and soon you&#x2019;ll be roasting, broiling, braising, stewing, saut&eacute;ing, steaming, and poaching with confidence and competence. In addition to the techniques, you&#x2019;ll find more than 200 sumptuous, all-new recipes that put the lessons to work, along with invaluable step-by-step photographs to take the guesswork out of cooking. You&#x2019;ll also gain valuable insight into equipment, ingredients, and every other aspect of the kitchen to round out your culinary education.<br /><br />Featuring more than 500 gorgeous color photographs, <i>Martha Stewart&#x2019;s Cooking School</i> is the new gold standard for everyone who truly wants to know his or her way around the kitchen.&nbsp;<br /><br />This best-selling cookbook originally inspired Martha Stewart's beloved PBS series of the same name and includes some of the recipes the show featured in its first seasons. <b>Prime Rib Roast</b><br /> Serves 8<br /> <br />Prime rib, or standing rib roast, has long been a mainstay at the holiday table (where it is often paired with Yorkshire pudding, a British specialty made from the pan juices and a simple batter of flour, eggs, and milk). As it is expensive, prime rib should be handled with extra care. It is imperative that you have an instant-read thermometer for determining the internal temperature; if allowed to cook too long, the meat will no longer be a rosy pink inside, the optimal color for any high-quality roast. Remove the roast when still rare, as it will continue to cook as it rests, rising as much as 10 degrees in 20 minutes. <br /><br />Rubbing meat (as well as chicken and fish) with herbs, spices, and a bit of oil will add tremendous flavor. Here, the beef is coated with a mixture of bay leaves, sage, and orange zest, all familiar holiday flavors. Allowing the meat to &#x201c;marinate&#x201d; in the rub overnight deepens the flavor even more. A similar result is achieved by simply salting the meat a day or two before roasting, whereby the salt will have penetrated the meat much like a brining solution. <br /> <br />Larger roasts such as prime rib, crown roast, and a whole turkey are started at a high temperature (450&deg;F) to sear the meat, then the temperature is lowered after 30 minutes to prevent the outside from burning before the meat is cooked through. The exterior won&#x2019;t develop a crust right away, but the initial high heat gives the outside a head start so that it will be perfectly browned in the end.<br /> <br /> <b>For Rub</b><br /> &middot; 15dried bay leaves, crumbled <br /> &middot; 1/3 cup coarsely chopped fresh sage leaves, plus several whole leaves for garnish <br /> &middot; 1/2 cup extra-virgin olive oil <br /> &middot; Coarse salt and freshly ground pepper <br /> &middot; 1/3 cup finely grated orange zest (from 2 to 3 oranges)<br /><b>For Roast</b><br /> &middot; 1 three-rib prime rib of beef (about 7 pounds), trimmed and frenched<br /><b>Prepare meat:</b> Stir together crumbled bay leaves, sage, the oil, 1&frac12; teaspoons salt, and the orange zest in a small bowl. Season with pepper. Rub herb mixture all over the beef, coating evenly. Refrigerate overnight, covered. About 2 hours before you plan to cook the beef, remove it from the refrigerator. Place beef, fat side up, in a roasting pan and allow it to come to room temperature. Meanwhile, heat the oven to 450&deg;F. <br /> <br /> <b>Roast:</b> Cook beef for 30 minutes, then reduce temperature to 350&deg;F and continue roasting until an instant-read thermometer inserted into meat (away from bone) registers 115&deg;F to 120&deg;F (for rare), about 1 hour to 1 hour 15 minutes longer. Let rest 20 minutes. <br /> <br /> <b>Carve and serve</b> Slice meat away from ribs, cutting along the bones. Then, slice meat crosswise to desired thickness. Serve, garnished with whole sage leaves.